Over the past two years, I’ve taken advantage of an opportunity to learn and connect with an impressive and diverse array of rabbis at a retreat for CLAL’s Rabbis Without Borders program. At this past retreat, I had the pleasure of meeting and getting to know a very impressive rabbi — Rabbi Hanan Schlesinger, an orthodox rabbi who lives in one of the settlements outside of Jerusalem and spends most of his time running a pluralist learning program he leads once a month in Northern Texas. We connected because of our mutual interest in Jewish perspectives on Christianity so we decided to continue our correspondence after the retreat as hevrutapartners to learn the New Testament together over Skype. Our learning has been fabulous, and though at some point I’ll be teaching with some of the insights from our learning, the joy of learning is enough of a reward for me. However, I never expected that because of our learning and the relationship I developed with this very special rabbi that our community would have the opportunity to host a one-of-a-kind event that could significantly raise the profile of our congregation, connect us with some of the major Jewish institutions in our area, and most importantly deal with a topic that is on the mind of every Jew at this moment. 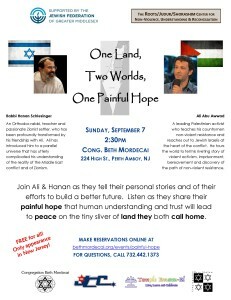 On September 7th, we will be hosting my hevruta partner and passionate Zionist settler, Rabbi Hanan Schlesinger, and a Palestinian peace activist who promotes non-violence, Ali Abu Awwad. They will be sharing their powerful personal stories — how one’s religious beliefs led him to make aliyah and settle in the Israeli settlements of Gush Etzion; how the other eschewed affiliation with a terrorist cell to become a leading voice among Palestinians for peace, reconciliation, and non-violence; and how both of them have come together to bring together Israelis and Palestinians in a small strip of land they both call home. There is much more to share about what Hanan and Ali are doing, which is why I hope you make a concerted effort to attend (and bring your friends!) to our event on September 7th — the only event of its kind in New Jersey. There isn’t much time to spread the word, but it’s an opportunity that has arrived on our doorstep and we must take advantage of it. Let us kick off the month of Elul, the month in which we have the opportunity to blow the shofar each day to spur our self-reflection prior to the High Holidays, to take advantage of the opportunity to reflect on the current Israeli-Palestinian, and how there may be an albeit painful hope for peace in our ancestral homeland. Please click here to “join” the event (entitled “A Painful Hope”) on our Facebook page (and please share the link with your friends!). Please click here to learn more about the event on our website and to register for it.